Visitors to Florida’s Gulf Coast should make Tampa, Florida their destination for both excitement and relaxation. Whether traveling solo, with the family or as a couple, Tampa offers tons of things to see and do to make your trip fun. This city near the coast provides the perfect mix of a metropolitan destination, historic sights and unbeatable attractions. The crystal-clear waters of the Gulf are only a short drive away, making Tampa the ultimate city to visit in Florida. These thrilling activities in Tampa are just the beginning! 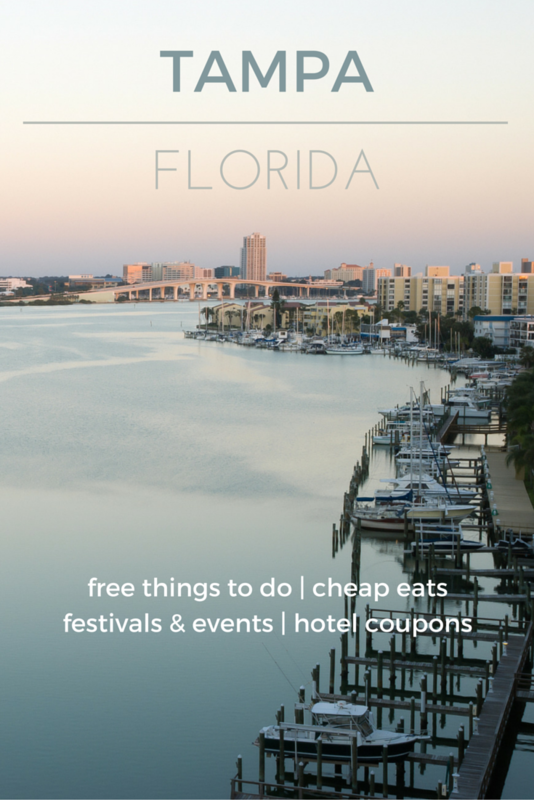 Check out our list of free things to do in Tampa below to help you plan your vacation, while saving you money on your upcoming trip. While Downtown Tampa offers plenty of things to see and do, many visitors will drive a short distance to the beaches of Clearwater and St. Petersburg to spend a day on the beach. Stroll the historic streets of Ybor City, the center of latin culture in Downtown Tampa, dating back to 1886. You’ll find authentic restaurants to try and unique shops to explore. Enjoy Sunsets at Pier 60, a daily event overlooking the Gulf of Mexico. Visitors will find arts and crafts vendors, food, beverages and entertainment each night from 5:30 - 9:30 p.m.
Open each year during manatee season (November - Mid-April), this free place to see manatees is the perfect attraction for animal and nature lovers. Step back in time when you explore Pinellas County Heritage Village near Tampa. This free attraction is the perfect way to explore Florida’s rich history first-hand, by visiting historic buildings and meeting docents in period-dress. Overlooking McKay Bay, Desoto Park provides a great place for fun in the sun. Amenities include picnic tables, a playground, a skate park and more. The museum suggests a donation of $10 per adult, however the fee is not required to gain entry.